Granola is an excellent breakfast or snack option to have on days when you are highly active. Many granola varieties can be very high in sugar, so why not make your own to suit your specific needs and tastes? Place the oats, mixed nuts, almonds, pumpkin seeds and cinnamon in a large bowl and mix to combine. Warm the oil and honey in a small pan set over a medium heat, then add this to the dry mix, stirring well to make sure everything is evenly coated. 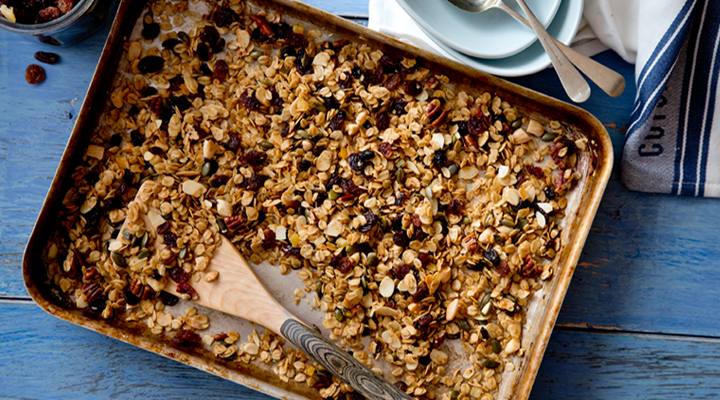 Spread the granola out on a baking tray and bake in the oven for 15 minutes. After 15 minutes, add the dried fruit and give everything a good stir, then bake for another 10 minutes, until the granola is a light brown colour. Allow to cool completely and store in an airtight container or jar. Tip: Double this recipe and make a big batch for the week ahead if you want to save time. Tip: Don't add the dried fruit in the beginning or it will burn. Add it in after 15 minutes and cook for no more than 10 minutes.